A protein molecule, "BINDI," has been built to trigger self-destruction of cancer cells infected with the Epstein-Barr virus. Numerous cancers are linked to the Epstein-Barr virus, which can disrupt the body’s weeding of old, abnormal, infected and damaged cells. The Epstein-Barr virus persists for a long time after a bout with mononucleosis or other diseases for which it is responsible. It survives by preventing cells from disintegrating to kill themselves and their invaders. The virus' interference with cell population control may contribute to cancerous overgrowth. Erik Procko of the UW Institute of Protein Design was among the scientists who engineered and tested the novel protein. In a June 19 report in the scientific journal Cell, researchers describe how they computer-designed, engineered and tested a protein that overrides the virus’ interference. BINDI, they discovered, can prompt Epstein-Barr-infected cancer cell lines to shrivel, disassemble their components and burst into small pieces. Lead authors of the paper are Erik Procko of the Department of Biochemistry and Geoffrey Y. Berguig of the Department of Bioengineering, both at the University of Washington. They collaborated with scientists and clinicians at the UW, Fred Hutchinson Cancer Research Center, Seattle Cancer Care Alliance and Scripps Research Institute. The research team also tested the protein in a laboratory model of Epstein-Barr virus-positive lymphoma. Lymphoma is a type of cancer that can affect the lymph nodes, spleen, bone marrow, blood and other areas of the body. The researchers grafted lymphoma tissue onto mice as a living system to evaluate BINDI's therapeutic properties. The scientists delivered the protein into cancer cells via an antibody-targeted nanocarrier newly designed to deliver protein cargo to intracellular cancer targets. BINDI behaved as ordered: It suppressed tumor growth and enabled the mice to live longer. A researcher prepares samples of the synthetic BINDI protein for testing. The work also demonstrates the potential to develop new classes of intracellular protein drugs, as current protein therapeutics are limited to extracellular targets. BINDI was designed to recognize and attach itself to an Epstein-Barr virus protein called BHRF1, and to ignore similar proteins. BHRF1 keeps cancer cells alive, but when bound to BINDI, it can no longer fend off cell death. 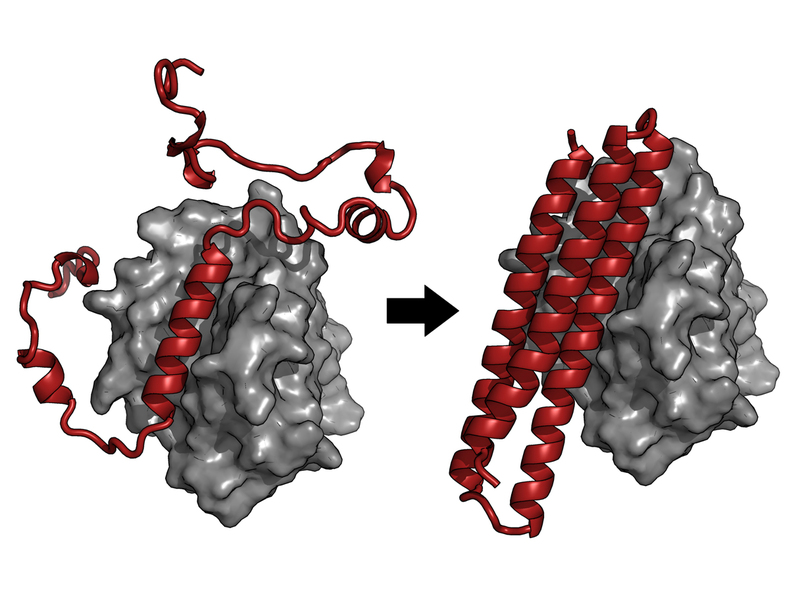 By examining the crystal structure of BINDI, the scientists saw that it nearly matched their computationally designed architecture for the protein molecule. “This close agreement between the protein model and the actual structure highlights the success in which designer toxins can be developed,” the researchers said. Grants from the National Institute of General Medical Studies at the National Institutes of Health (P41 GM103533, R01 GM49857, R21EB014572), Washington Life Sciences Discovery Fund and the U.S. Defense Threat Reduction Agency supported this project. Computational resources came from Berkeley Open Infrastructure for Network Computing, which received National Science Foundation support. Stayton and Press are co-founders of PhaseRx Pharmaceuticals, which holds licenses for aspects of the new drug delivery carrier tested in this study, but indicated that the work reported is independent of the firm. News editors: Media contacts for this story are Elizabeth Hunter (206.616.3192, elh415@uw.edu) for UW Medicine and Michael Nank (206.667.6906, mnank@fhcrc.org) for the Fred Hutchinson Cancer Research Center. The Cell paper, “A computationally designed inhibitor of an Epstein-Barr viral Bcl-2 protein induces apoptosis in infected cells,” will be available online at 9 a.m. PST June 19. Credentialed journalists may access the copy in advance by contacting Mary Beth O'Leary (617.397.2802, moleary@cell.com) at Cell Press.